You are here: Home / Features & Articles / What are uPVC Bifold Patio Doors Prices? Initially, to find out what Front & Bifold Patio Doors Cost you should have an idea of the overall look you want to achieve, material that your prefer that they are made from and, of course, check the size. The look, material, colour, whether you have them professionally fitted or not, and the size of the doors will all have some influence or other of the final pricing. A typical front door in the UK could be around 6 feet 6 inches high by either 2 feet 6 inches or 2 feet 9 inches wide & to fit a bifold set of doors you would need an opening of over 6 feet wide. 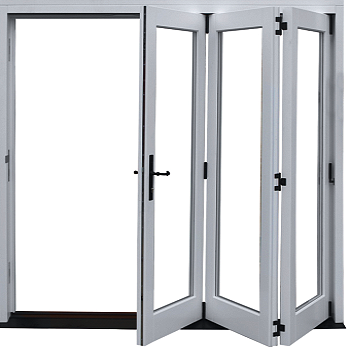 Bifold doors suit wider openings so that you can have 3 or more panels. For wider front doors, you can either fit side panels or have a double door set. Where the head height for your front doors is much bigger than a standard door size, you can fit top lights. Upvc tends to be the lower cost option when it comes to new or replacement doors, with the hardwood equivalent being much more expensive, bear in mind that it is not unusual for some of the composite or hardwood doors being priced at several hundreds of pounds to buy & fit. Fair Price for double glazed windows?